Times Internet Limited (TIL) has launched BoxTV.com, its premium video streaming service. The portal will feature movies and TV shows which users will be able to stream and watch on their computers or mobile devices including iPhone, smartphones and tablets. BoxTV.com will feature premium along with free content. Subscription charges for premium content across the website are currently Rs. 199 per month for Indian users, $4.99 for users in US and £4.99 for UK based users. Currently membership is on an invite-only basis and hence we could not take the portal for a spin. 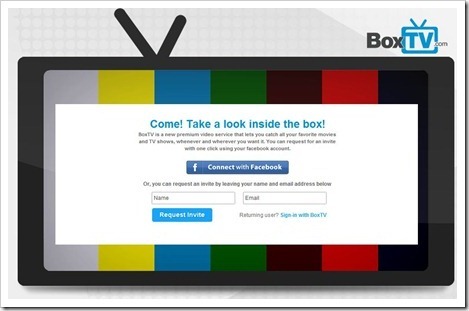 To become a member, users will need to go to www.boxtv.com and request an invite either by logging in with their Facebook accounts or by registering their name and email address. BoxTV.com’s services will be accessible across all the commonly used tech platforms including PC, iPad and other iOS and android based devices. Users will be able to stream content directly through web browsers. BoxTV.com’s auto bandwidth optimizer ‘optimizes the video streaming for best possible experience’. Apart from mainstream Bollywood and Hollywood movies, BoxTV.com will also feature regional content in local languages including Gujarati, Marathi, Tamil, Telugu and Kannada. The content on the website will be driven by TIL’s partnership with Indian and international partners including local distributor Shemaroo, Walt Disney India owned UTV and owner of hit franchisees including Spider-Man, MIB and Underworld, Sony Pictures. Besides the domestic online audience, BoxTV.com is also aimed at Indian expats and the Indian-origin population in foreign countries. TIL’s latest venture is not the first one of its kind. There are many Netflix-like premium content portals servicing the needs of entertainment hungry Bollywood fans. However unlike Netflix in the US, there is yet to emerge a clear market leader on domestic shores. A quick look up on a keyword tool of one of internet’s biggest company reveals that more than half a million searches are being made every month globally by users looking for a website to watch Bollywood movies online. The search results typically range from legit websites with an unimpressive content bank to legally questionable portals hosting part-by-part uploads of full movies made by anonymous users. Commentators have time and again asked whether users will be willing to pay a membership fee despite the fact that there is significant amount of free-to-access content available online. Netflix’s membership base of more than 2.6 crore worldwide paying users is example that quality backed by a vast content bank certainly has a following. Since its alpha launch BoxTV.com has got more than 50,000 invitation requests from India, US and UK, reported ET. Google, Yahoo and number of other online companies including a few production houses have launched similar services earlier. While some of them are free, some are paid premium services. Google is probably the most popular currently offering Bollywood movies and serials online for free. It will be interesting to see how BoxTV manages to fight out these free services. Satyan Gajwani, CEO, TIL is confident and opines “We feel there is a huge opportunity in India to do a premium-content service. Our focus is on the quality and we want to make sure that we delight our users with this service. This will set us apart from other video streaming websites and services“. He also mentioned that BoxTV.com will have a ‘large content bank’, which will potentially see the portal rise above smaller players.